Bill is the “big picture” guy, overseeing the entire organization’s direction and flow. He continually scrutinizes and evaluates business activities from 20,000 feet. He also engages in valuable face time with clients to review their overall satisfaction with Synergy’s products and services. Bill sits on the IRWA sub-committee, CRWEF, where he advocates for furthering the education of right of way professionals. Bill has his SR/WA designation and facilitates several IRWA courses. He is also a member of CAPL and AASLA and is a long-time volunteer with the Calgary Stampede’s Downtown Attractions committee. As executive vice-president, Keith is responsible for Synergy’s day to day operations, ensuring branch and project management are at optimal levels. He oversees client relations, process development, project execution, and the maintenance of Synergy’s proprietary database. As a mentor, Keith provides guidance and direction to all team members in every aspect of land management. Keith looks forward to the opportunities for growth and diversification that lie ahead and the role he will play in leading the team. Keith has achieved his SR/WA designation and stays involved with the IRWA through various committees, and is also a member of CAPL and AASLA. He also volunteers for his kids' many sporting activities. Rory has been involved with agriculture his entire life, having grown up on his family’s mixed farm in Vauxhall, Alberta. His hands-on background in agriculture, the oil patch and road construction enables him to identify with landowner concerns and to adapt to unique situations both theoretically and practically. While attending U of C, Rory discovered a career that appealed to his agricultural roots and he switched gears immediately. After several years in the industry, Rory joined Synergy where he has quickly emerged as a leader and mentor of junior staff. He contributes significantly to the structure and future direction of Synergy. Rory has achieved his SR/WA designation and is the president-elect for the IRWA Calgary Chapter. Dan joined Synergy in 2011, and has taken on increasing responsibility, initially as branch manager and now including the role of regional director – central. He has worked hard to cultivate business relationships in the Edmonton region and to market the Synergy brand. He has played a significant role in overseeing specific project work and opening branch offices in Brandon and Cambridge. Dan is a great communicator and his strength lies in his listening skills and his ability to put people at ease. Dan is an active member of the IRWA and currently sits on the executive for Chapter 62. He is also a long-time volunteer in his local community and encourages his team members to contribute their time to local charitable organizations. Jennifer’s first career was in the medical industry, but switched to oil and gas when she recognized the potential for a lifelong career with unlimited growth opportunities. Jennifer has worked in all aspects of surface land and has advanced quickly due to her work ethic and no-nonsense attitude. She is a leader in the company who brings a fresh perspective and ideas for the future growth of the company. Jennifer continues to upgrade her education within the field. She has obtained her C.P.S.A. designation through CAPLA/Olds College, and has assisted other surface land professionals throughout the industry in achieving the same designation by facilitating study groups. She is a CAPLA member and volunteer, and also volunteers on her children’s parent councils. Kevin is a go-getter extraordinaire who never quits. 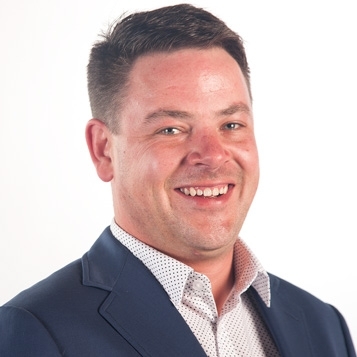 Having spent several years pursuing a career as a professional goalie, followed by obtaining a bachelor of Commerce degree with a concentration in Petroleum Land Management, Kevin understands and personifies dedication, excellence and overcoming challenge. He has worked steadily in the oil and gas industry for over 16 years, in the field as a mineral and surface landman, coordinating land sales, while successfully maintaining and enhancing new and existing client relationships. Kevin currently oversees Synergy’s business development and mineral departments. He is integral in establishing and streamlining processes, improving efficiencies and providing top-notch service to all Synergy clients. Tammy recently joined the Synergy team as branch manager of the Fort St. John office, bringing with her almost 20 years of industry experience. Like many others, she started as a receptionist with a land broker and progressed through the ranks from junior to senior land administrator, to an office manager position. Eventually she took the leap of starting her own land company, Axis North. Over the course of her land career, she has developed valuable and long-term relationships with land industry colleagues, clients and stakeholders. Tammy is excited to take the reins of the Fort St. John office firmly in hand and to lead her team toward growth through exceptional service and results. Troy was born and raised in Saskatchewan and has spent his entire professional career working in all aspects of Saskatchewan Land. His previous work experience in the Land Titles and Geographical Information industry and education in Human Justice and Management Development lend themselves to his role as branch manager. He is the consummate leader and mentor, effectively sharing his knowledge with the Synergy team. Troy’s expertise is in large acquisition and divesture projects, analyzing complex mineral and surface issues and interpreting how current and past legislation affects those issues in the province. He provides exceptional customer service and high-quality, innovative solutions to address clients’ business needs. Troy is an extraordinary professional who attends to every detail and communicates effectively with staff and clients alike. Gerry grew up on his family’s grain farm near Brandon, Manitoba. After graduating from high school, he enrolled at Brandon University where he earned a B.Sc., with a Geology major and Geography minor. Eager to join the work force, he started his oil and gas career in Saskatchewan and spent the next 20 years as a petroleum geologist, working in-house at oil companies and performing well site work as a consultant. He drilled over 300 vertical and horizontal wells in every viable formation in the Saskatchewan/Manitoba portion of the Williston Basin. Largely due to his agricultural background, Gerry found the land business fascinating, and in 2013 decided to make a career change. He brought his upstream oil and gas experience to Synergy where he serves as the Brandon branch manager. Gerry is working towards his SR/WA designation through the IRWA, and is excited to be growing the Synergy brand in his home town. Paul joined Synergy midway through 2016, taking on the role of branch manager in Cambridge. Previously, Paul worked in the corporate communications field delivering tools such as: video, photography, conference and trade shows, and internal and external communications. He focused on people, the environment, Aboriginal involvement and stakeholder information for TransCanada Pipelines, Inter Pipeline, Kinder Morgan Canada, Suncor Energy, Arbonne Canada and Cisco Systems. Paul is a skilled communicator who deals with people at all levels of business with equal acumen and diplomacy, and as a result, has developed long lasting relationships. He is highly organized, detailed and provides quality results. Paul prides himself on understanding clients’ needs and always strives to exceed their expectations. He is a member of the IRWA through which he maintains a network of industry colleagues. He has hit the ground running and is set to grow and diversify business in Ontario.